The placement season for the Batch of 2013 was a resounding success, both in terms of the companies that visited campus, as well as the variety of profiles that were offered to the students. While there was continued participation from the past recruiters like J.P.Morgan, Dell, Infosys, Igate, etc., visiting the campus again, there was a remarkable increase in the new recruiters spread across sectors like BFSI, FMCG/FMCD, Logistics, IT/ITES etc. 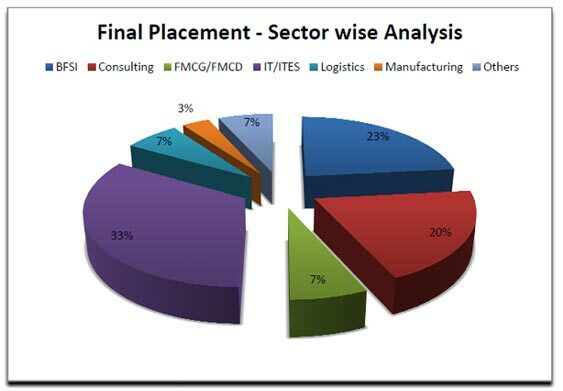 The Final Placement process saw about 58% of recruiters visiting campus for the first time, with prominent names like Accenture, Capgemini, Genpact, HSBC Bank, Mahindra Logistics, Samsung India Electronics, Usha International hiring our students. Financial Roles like Corporate Finance, Equity Research, Credit Analyst, and Financial Operations were offered by companies like J.P.Morgan, Dell, HSBC Commercial Bank, and Oracle. B2B Sales, Key Accounts Management, Marketing & Business Development roles were offered by some of the majors like Samsung India Electronics, and Usha International. Recruiters like Mahindra Logistics, Zinnov Management Consultancy, Entercoms & Jda Software offered consultancy roles in different domains like Technical, Supply Chain, Quality Excellence, Strategy and Management. Companies like Deloitte, Infosys BPO, and Caterpillar offered roles of HR Analyst, Human Capital Advisory across domains. The students did their summer internship across sectors again an evidence of the diversity we posses. The sectors include Automobile, BFSI, FMCG, IT/ITES, Consulting, Manufacturing, Pharmaceuticals and Retail. The participation of key organizations for the Placement Season is a testimony to the blend of talent and grooming that stands a class apart at SIBM Bengaluru.